Sunderland Harriers host their 24th Sunderland 5k Road Race tomorrow night at Silksworth Sports Complex with class fields chasing Northern and North East championship medals. This will be the final year of a three-year contract in staging the Northern Athletics event and the Wearsiders are determined to again get in on a slice of the action. Last year, the women’s and men’s teams won silver team medals in the three-to-count team races and they go into the events in confident mood. And for the first time since Mark Hood’s victory in 2008 there is another Sunderland runner with an outside chance of winning the men’s race. Oliver James, on summer leave from college in America, where he is studying dentistry, is in fine form and has already notched up two wins since his return to his parents’ home in Tunstall. While the two events did not attract the best of North East talent, his victories in the Lambton Run and the Angel View Run, were significant in the manner of his wins. He was in control throughout the races and was never fully extended as he gained comfortable victories. It will be no easy ride for James this time as the event is normally won in a time of under 15 minutes and packed with some of the North East’s leading endurance runners. In last year’s event, Morpeth’s Peter Newton won in 14.43 and the course record stands to Martin Scaife with14.23 from 2004. James’ fastest road 5k stands at just 16 minutes, although he has clocked 14.54 indoors on the track. But with home advantage and no doubt much underlying talent yet to emerge the 24-year-old could be the dark horse. In the team event, James will be supported by Kevin Jeffress, Steve McMahon, Ian Dixon and Ian Ritchie, who finished seventh in the Great North 10k on Sunday at Gateshead in 35.52. The leading men entered so far are last year’s runner-up Dominic Shaw (New Marske), Sam Hancox (Morpeth), Michael Grimes (Durham), Greg Jayasuriya (Midds & Cleve), Adrian Bailes (Birtley) and Alex Brown (Houghton). The Sunderland women’s team will be headed by Alice Smith, the winner of last week’s Pit Stop 10k (41.02) at Croft and she was fourth woman to finish on Sunday in the Great North 10k (40.12). She will be joined in the team by Amy Callaghan, Sarah Knight, Eve Quinn, Michelle Avery and Jessica Fox. Among the leading women entered are: Danielle Smythe (Heaton), Charlotte Penfold (North Shields) and Georgia Campbell (Jarrow and Hebburn). 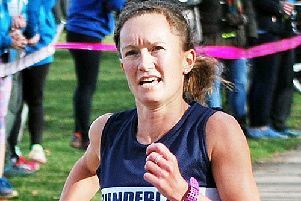 The women’s record stands to Sunderland Stroller Alyson Dixon, who became the first woman on the course to dip under 16 minutes, recording 15.52 in 2014. Again there will be two races with the women and over-50 veteran men off at 6.45pm and the senior men and over-40 veterans starting at 7.20pm. The race headquarters for registration and presentation is Silksworth Sports Complex. The course is over two laps which takes in both lakes, with the small fishing lake the first circuit to be completed. The finish is on grass, behind Sainsbury’s supermarket. There will be a limited number of late entries available. While dipping below 16-minutes is the benchmark for many a leading club runner, only two Sunderland Harriers have been under 15 minutes - Brian Rushworth and Mark Hood. Rushworth won the race six times and Hood twice. The top 20 Sunderland times are: 1 Brian Rushworth 14.34 – 2000, 2 Mark Hood 14.39 – 2011, 3 Gavin Massingham 15.08 – 2008, 4 Derek Mullen 15.11 – 2000, 5 Graham Lancaster 15.16 – 2001, 6 Patrick Martin 15.19 – 2006, 7 Richard Kemp 15.20 – 2003, 8 Tom Doughty 15.21 – 2004, 9 Kevin Calvert 15.21 – 2014, 10 Andy Powell 15.27 – 2017, 11 Sparrow Morley 15.29 – 2016, 12 Steve McMahon 15.29 – 2016, 13 Kevin Jeffress 15.32 –2015, 14 Lee Browell 15.33 – 2001, 15 Andrew Lilliendale 15.37 – 2002, 16 Mark Donkin 15.38 – 2001, 17 Dave Grover 15.44 – 2000, 18 Steve Potts 15.46 – 2004, 19 Ian Haggan 15.47 – 2003, 20 Ian Ritchie 15.58 – 2016. Houghton Harriers middle distance runners Henry Johnson and Will Bellamy had significant victories before they depart for the English Schools’ Track and Field Championships in Birmingham at the weekend. They were competing for the North East in the Northern Athletics Inter Counties match at Leigh and they both won their 1500m events with first class performances. Johnson won the A race in 4.02.11 and Bellamy the B race in 4.03.62. The North Eastern Grand Prix at Monkton has been cancelled and will not be rescheduled.